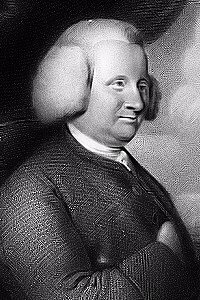 June 1, 1727, Exeter, England (grandson of hymnist Joseph Stennett). August 24, 1795, London, England. Bunhill Fields Burial Ground, Islington, London, England. The following biography appeared in Seventh Day Bap­tists in Eur­ope and Amer­i­ca: Historical Papers Written in Commemoration of the One Hundredth Anniversary of the Organization of the Seventh Day Bap­tist General Conference Celebrated at Ashaway, [Rhode Island], Aug. 20–25, 1902. Vol. 1, pp. 11–18. Dr. Samuel Stennett was born in Ex­e­ter, in 1727. He was converted and was baptized when young. Like his father he was a man of superior talents and great erudition. Iv­i­mey says:- His proficiency in Greek, La­tin and Or­i­en­tal tongues and extensive acquaintance with sacred literature, are so abundantly displayed in his valuable works that they cannot fail to establish his reputation for learning and genius. He had been accustomed to move in the society of persons of refinement; and on entering upon his pastoral duties in Lon­don he was remarkable for the ease and sua­vi­ty of his manners, for the good breeding, the polished language, and the graceful ways of the true gentleman. He was frequently in company with persons enjoying the highest social distinction and in such situations as gave him an opportunity to commend Bap­tists and aid Dis­sent­ers of all denominations. In 1763 he was made a Doctor of Divinity by King’s College, Aber­deen. Among the noble men who waited upon his ministry and loved him with the affection of a friend was John How­ard, the philanthropist. In a letter from Smyr­na, written to Dr. Sten­nett August 11, 1786, Mr. How­ard says:- I bless God for your ministry; I pray God to reward you a thousand fold. My friend, you have an honorable work; many seals you have to your ministry. He ministered to the Little Wild street church as his father’s assistant for ten years; and as its pastor, after his father’s death, for thirty-seven years. The meeting house was rebuilt during his ministry. His father, Jo­seph Sten­nett, D. D.; his grandfather, Jo­seph Sten­nett; his great-grandfather, Ed­ward Sten­nett; his brother, Jo­seph, and his son, Jo­seph, were all Bap­tist ministers—and Sabbath-keepers. Dr. Sam­u­el Sten­nett was a hymn writer of note. He wrote the beautiful and well known hymn, Majestic sweetness sits enthroned upon the Sav­iour’s brow; also On Jor­dan’s stormy banks I stand. Most of his works were reprinted in 1784 in three oc­ta­vo volumes. In 1772 he published a work entitled Remarks on the Christ­ian Minister’s Reasons for Administering Baptism by Sprinkling. In 1775, An Answer to the Christ­ian Minister’s Reasons for Baptizing Infants. He was also author of productions treating of appeals to Par­lia­ment by Pro­test­ant Dis­sent­ers for relief from persecuting enactments. And Have I Christ, No Love for Thee? And Will the Offended God Again? How Shall the Sons of Men Appear?